Although DreamWorks Animation’s slate has been somewhat underwhelming as of late – it was in a brief slump when How To Train Your Dragon 2 and The Penguins of Madagascar underperformed at the box office, and while last year’s Home was popular enough to get itself out of that mess for the time being, that film brought about some of the worst reviews the studios have received in a while (and that’s not even looking at its future, presumably grim slate of films – its November release Trolls just brought out a bloody awful trailer that invokes bad memories of The Smurfs, and the one scheduled after that one is named Boss Baby. We repeat: BOSS BABY. And yes, it’s about exactly what you think it’s about. Do we even NEED to say why we’re worried?!). For the moment, however, let’s be thankful that every so often they’re still putting effort into at least some of their films, with Kung Fu Panda 3 being the latest of these particular special seeds. The third and presumably final in the studio’s heavily-popular series, with Jack Black voicing the titular panda who also knows a fair bit of kung fu, rounds out this increasingly impressive trilogy in ways that far lesser animation studios can only dream of doing, upping the ante when it comes to its character development, its playful sense of humour, and – above all else – its own animation, which continues to be absolutely stunning in both its style and its execution. In this one, Po (Black) finally meets his biological panda father Li Shan (Bryan Cranston) – much to the chagrin of his adopted goose father Mr. Ping (James Hong, who continues to be the series’ underestimated secret weapon) – who takes him to the hidden community of pandas to learn the mystical panda technique of harnessing one’s “chi” (basically, it’s the Force but way more Oriental and spiritual). But he’ll need to learn it fast, since the powerful and imposing ox warrior Kai (J.K. Simmons) has returned from the spirit realm – or, as John Hurt in Kingdom of the Crystal Skull might put it, “the space between spaces”) – to steal the chi from kung fu masters, and has set his eyes on Po and his newly-discovered panda tribe. It’s a fairly straightforward good vs. evil story, but like the previous two films this one tells its story in the most welcoming way possible, one that doesn’t outstay its welcome and doesn’t forget to include the right amount of drama exactly when it’s needed, even in the middle of the incredibly fun set-pieces and riotous comedy. That helps the characters be that little extra fun to watch without once getting too aggravating, a trick that stupid and annoying Jim Parsons alien from Home could have sorely used; Po is a far more engaging character, whether he’s fangirling over new kung fu stylings and old artefacts, or learning more about who he really is in the many scenes he shares with his warm-hearted father, and you find yourself actively engaged in finding out whether he’ll succeed or not. It’s filled with tons of fun supporting characters, with Hong and Cranston being specific standouts, and while Simmons’ villain isn’t necessarily the strongest in the series he is a very imposing figure and, thanks to Simmons himself, sounds like he’s having fun with how big and evil he is. The star of the film, however, is and continues to be the animation, and credit must go to co-director Jennifer Yuh Nelson, director of the second film, for maintaining the absolutely beautiful integration of Eastern-inspired 2D animation with the popping and playful CG environments, the latter of which only coming into play in flashback sequences and other minor instances but are still gorgeous nonetheless. This animation continues to be some of the studio’s most creative and colourful, and lovers of the medium will surely find inspired designs to appreciate while young children will be entranced by the beautiful colour schemes. 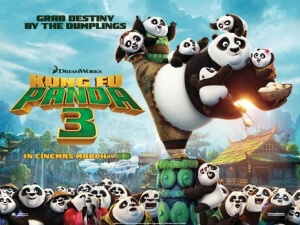 Kung Fu Panda 3 is a wonderfully inviting third entry into DreamWorks Animation’s successful franchise, upping its ante with its fun characters, clear sense of humour, effective moments of drama, and some of the studio’s most creative and colourful animation to date.